I am doing a PhD in addiction neuroscience at the Florey Institute of Neuroscience and Mental Health. I started my PhD as a way of changing careers, after ten years working in policy and research roles in the water industry. Because I was giving up a career in order to study again, I looked for a topic that fuelled my curiosity, inspired me, and where I could make a difference. I chose adolescent health because the teenage years are formative for health and well-being into adulthood, and addiction neuroscience because there remains so much unknown about the causes and long-term effects of addiction. I funded my PhD with an APA scholarship and started studying in March 2015. I study adolescent inhalant abuse in human cohorts and using an animal model. A highlight of my studies so far was finding out for the first time in humans that adolescent inhalant abuse can restrict growth and alter an individual’s height trajectory. I’d like to use this information as a public health warning about inhalant abuse for young teens. I was really excited to then replicate these findings in an animal model, which hopefully means that I will be able to identify the mechanism behind these changes. I love doing my PhD, but one challenge for me is that I have two young daughters. They were 1 and 3 years old when I started! It makes life busy but I hope that I am being a positive role model for them and showing them that they can achieve a fulfilling career and motherhood. I am a member of the Equality in Science Committee at the Florey, and my daughters are the reason I am a passionate advocate for women in STEMM. 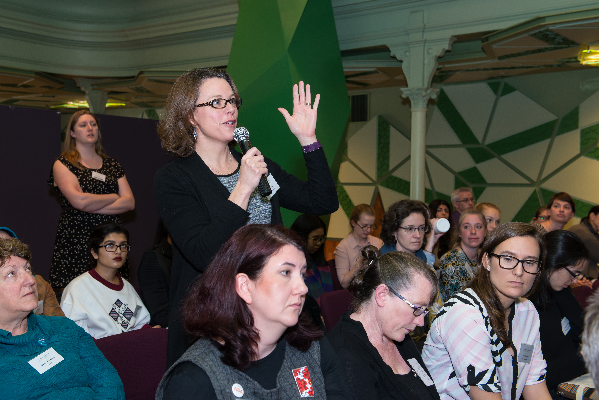 What motivated you to get involved in supporting women in STEMM? My daughters, Zara and Isla! In 15 years’ time, my eldest daughter will be leaving school. If she comes to me and says that she wants to be an engineer or a scientist or a mathematician, I want to be able to tell her that being a woman doesn’t make a difference. Yes, I studied statistics plus biology, chemistry and physics. I was one of the few girls doing physics and I found that discouraging and a bit lonely sometimes, but it made such a difference having a solid grounding across the sciences when I started university. It’s something I’d recommend to other girls. What compromises have you had to make to reach this point in your career? Changing careers was hard, because I was giving up my networks and position in that industry (and my salary!) to start my PhD. Also, I’d wanted to do a PhD for a long time, and had to choose between being an older PhD student or an older mother; the kids came first! What is it you love about science? I love the sense of discovery and that every day brings something new. I think I’ve always been a scientist, ever since I was a child. I never grew out of asking questions! It feels good that I can have a fulfilling career and hopefully make a difference. How does postgraduate life compare to working life? Being a PhD student has its challenges, particularly managing on low pay now and worrying about job security in academia when I’m finished. But studying is quite flexible, particularly when I’m writing. I am very lucky in my supervisors, who allow me to work flexibly, and that makes a huge difference.